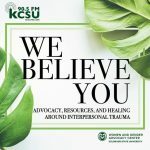 We Believe You is a podcast for survivors of interpersonal violence focused on advocacy, resources, and healing around interpersonal trauma Each episode will focus on some of the common issues both primary and secondary survivors face. The show is hosted by the advocate team of the Women and Gender Advocacy Center at Colorado State University. In this episode we address how our bodies physically react to trauma. Knowing how you reacted to a trauma and what is going on in our brains and nervous systems can help survivors release guilt and can help our support systems be more understanding about the vastly different ways people react to traumatic experiences. Casey is joined in this episode by Dr. Deana Davalos, a neuropsychologist, who will talk about the impact trauma has on our brains. In this episode, Marie will be exploring barriers that survivors of color face when trying to access services such as advocacy centers, university or police reporting. The barriers covered in the episode are mistrusting systems, a history of violence, stereotypes, and dynamics within communities. Through our work we are often asked to provide recommendations about books and resources so survivors can practice self-empowerment in learning more about how to heal and cope with their experience. We hope to dedicate one episode in each season to making some suggestions. Casey, Jessica, and Marie will each share some of their favorite resources.